Easter in my family is a big deal. Everyone gets an Easter basket (even the adults!) and they are typically filled with candy and trinkets. For a child, that pretty basket filled with pastel eggs and chocolate, jelly beans and other sweets is a dream come true. For an adult who is diligently focusing on health and maintaining 4 year old New Year’s Resolutions… it can be a nightmare. So, when Kroger gifted me a $25 gift card to create an Easter basket, I knew right away what I WASN’T going to get. My hubby and I have been working out for months and watching our sugar and fat intakes with the intention of being healthier overall. The last thing I want to do is throw him off track with jellybeans and chocolate eggs. Thankfully, Kroger has a great selection of healthier (if not healthfood) options that are perfect for baskets! Check out all of the items I was able to get for that one $25 gift card! Selecting healthier options boils down to a few key ideas. 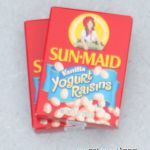 My hubby LOVES yogurt covered raisins and they look just like jelly beans, so those were my first selection. While yogurt covered raisins are high in sugar, they are usually less sugary than jelly beans. Then I found the pretty pastel chocolate bar in the organic section. Dark chocolate (over 73% cacao) is a healthy selection we make often in my house. The flavor is rich and intense without a bunch of added cream and sugar. 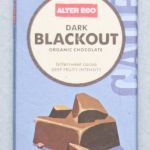 Note that doesn’t always mean fewer calories, but the intensity of dark chocolate often means it satisfies a craving for chocolate without throwing away all that hard work in eating well. It is intense so we eat less of it generally. In the end, I decided that the basket did need a bunny of some kind. 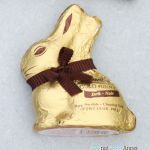 So I ended up with a dark chocolate Dove bunny. This isn’t as good a choice as the 72% chocolate bar, but it is festive and I thought it a worthy exemption. Fruit is an easy go-to for a basket like this. Kroger often has “manager’s specials” on fruits and veggies that they have too much of, or have been hanging around a bit too long. I took advantage of that and got 5 pretty and shiny red apples for 99 cents! These add a bunch of weight and fill into the basket. They are so popular, hubby stole one from my grocery bag and ate it before I even had a chance to make the basket. Probably the biggest gripe for me about candy and sweets is that they are usually not worth eating. Seriously, the only thing you get out of them is the taste. The rest is either bad for you or useless to you. One of Hubby’s goals for eating well is to get his recommended amount of protein. So I headed to the health food area and found a HUGE selection of trail mix/granola/meal bars. 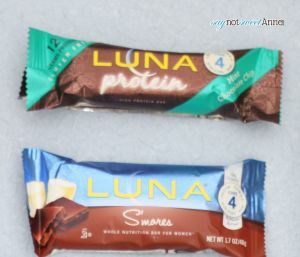 These cost about the same as a candy bar, but have a lot more nutritional value. I picked two that sounded delicious for the basket. We are pretty big suckers for sticky sugary candies like taffy, so I found several varieties of fruit leathers for about 50 cents each. They had the added bonus of pastel wrapping, so I grabbed them. 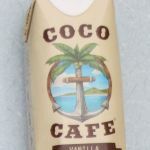 In the same aisle there was a Coco Cafe vanilla flavored protein/meal shake that I just know hubby will love since he is a giant fan of vanilla everything. Because these are picked out to suit his tastes, they are going to feel more like treats to him than some saccharine sucker from the candy aisle anyway. For a child’s basket, there would typically be some toys or other trinkets that will undoubtedly last longer than the candy components. 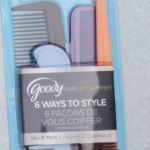 For this healthy basket, I chose to focus on “feel good” items for my husband. I want him to feel great about himself and the healthy choices he is making. 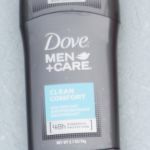 So, for the remainder of my gift card, I bought a 99c set of combs, some deodorant and bodywash. 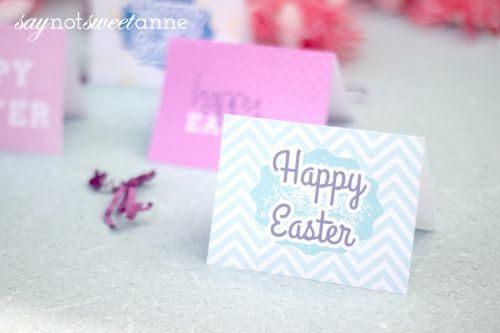 I made these adorable Happy Easter printable cards and envelopes just to put the icing on the cake… er… basket I suppose. Never underestimate the value of your own thoughtful words as a substitute for candy and treats!! 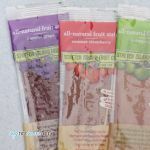 I LOVE your ideas for healthier alternatives. My son loves raisins, so I am definitely going to plan on putting those in his basket. He already got so much candy in a package from my mother-in-law, so I really don’t want to add to it! Those little cards are super cute, too! I do not care much about the basket. All I need is goodies. I love receiving gifts and colorful eggs on Easter. I love this fest. Happy Easter. Fabulous ideas to create mesmerizing and healthier gift basket. It has been tremendous gift ideas and I also like Happy Easter card ideas. It’s just complete Easter Gift Basket.